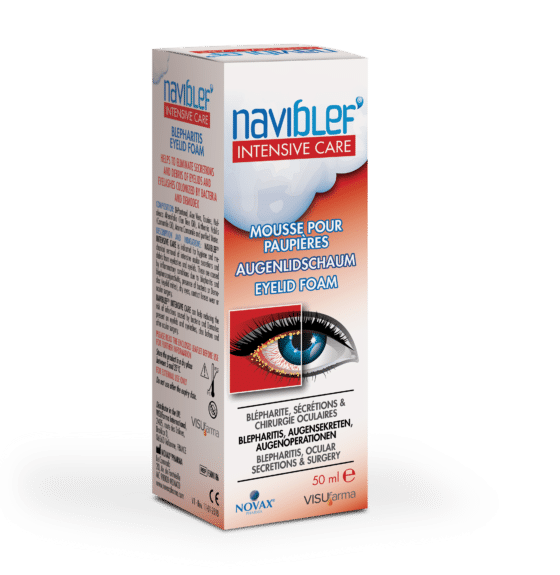 NaviBlef Intensive Care is a foam formulation containing Tea Tree Oil intended for hygiene and the mechanical removal of severe ocular secretions and debris from eyelashes and eyelids. NaviBlef Intensive Care can help reduce the risk of infections caused by bacteria and Demodex present on eyelids and eyelashes, also before and after surgery. NaviBlef Intensive Care is a non-greasy and non-irritant formulation, for topical use. NaviBlef Intensive Care may be used 2-3 times a day for a period between 7 and 14 days, for maximum efficacy. See package insert for full instructions for use. NaviBlef Intensive Care comes in the form of 50 ml bottle with foam dispenser. Safety is of paramount importance to the pharmaceutical industry. VISUfarma makes every effort to provide helpful, accurate information which is compliant with industry regulations. For more detailed information on NaviBlef® please visit our local VISUfarma websites here. and be directed to a regional website.